Ok, so… nothing’s been posted here for quite a while and there have been posts, shows and recordings so if you’d like to catch up check out the TF Facebook page here. Check the shows section on the page for the TF performances during the season of the witch for the Halloween Haunts. There is also a newer TF Tune to listen to here. 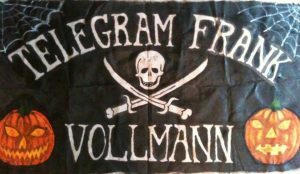 Posted in News on October 6, 2016 by Frank Vollmann. Ok so I’m off tomorrow to the US. Shortly after I return I’ll be doing a show with friends from Hungarian Lanterns at the world famous Pech & Schwefel. This oughtta be a blast, do yourself a favor and be present for this historic event. Posted in News on June 30, 2014 by Frank Vollmann. Thank you all for coming and making it a great night, I had a blast. Thanks to Jay for all the help, Justin and Fez for making me sound good,Diana for putting up with us and thanks to all of you for coming and making a few of our birthday’s very special. And thanks Mori RT (Ralf) for all the photos and videos. Cheers! Posted in News on May 27, 2014 by Frank Vollmann. Wake up in a haze from being ill (Real, not hangover) with a new song in the head and hands, forgot the healing power thereof. Breakfast of champions. Posted in News on May 19, 2014 by Frank Vollmann. And now very pleased to announce that Fez & Frank will ride again as Mr. Fez Wrecker will join us for a few songs on piano @ The Telegram Frank Birthday show, May 23rd in Berlin. There goes the friggin’ neighborhood. — with Fez Wrecker and Fez Wrecker. Posted in News on May 9, 2014 by Frank Vollmann. Happy to announce that Justin Stephens will be joining me on stage yet again for the May 23rd 2014 Birthday Show. Always good to have you along, Justin (With the “Did you really just say that… out loud?” look on his face). Photo by Olle Icke — with Justin Stephens at 12 Grad Aetherloge. Posted in News on May 7, 2014 by Frank Vollmann. Posted in News on April 14, 2014 by Frank Vollmann. Had great fun playin’ a few new tunes for my NYC friends and new folks as well as Dj’ing Wednesday at the Dorian Gray Party. Thanks to Sean and Mandana for setting it up, thanks to the party founders and crew for havin’ me and keepin’ me in cups. If you know anyone who got photos please send ’em along. Catch you guys in the summer? Posted in News on January 4, 2014 by Frank Vollmann. Posted in News on December 14, 2013 by Frank Vollmann. I had an absolute blast playing in Italy, thanks to the Athmos Cafe crew for having me and friends who came to support and share some good times, laughs and drinks. Grazie for the booze with the cobra and scorpion soaking in it! Posted in News on November 28, 2013 by Frank Vollmann. Thanks to all who came out last night and helped make it a whale of a show. We had a blast playing and where very happy to help Jörg bring in his birthday in proper fashion. Posted in News on April 23, 2011 by Frank Vollmann. 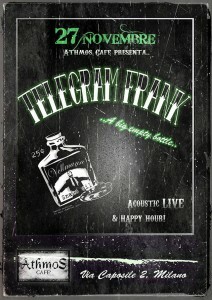 Telegram Frank will perform on Friday the 22nd @ Pech & Schwefel with Justin Stephens on backup guitar/vocals. If you haven’t been to the Pech & Schwefel yet this is your excuse. The atmosphere of this show should be reminiscent of the old Speakeasy shows so come on down and take part in the Traveling Medicine Show, where the audience helps create the snake oil. Posted in News on April 4, 2011 by Frank Vollmann. So Telegram Frank has a column in the 2011 Winter addition of Gothic Magazine (No. 70). I’m not sure when this issue hit the streets (Nobody tells me anything) so you may want to buy, steal, or borrow a copy soon before they’re all gone. This one is a true story about an occurrence involving Yours truly in a train station in New York City. Posted in News on February 7, 2011 by Frank Vollmann. The Telegram Frank show last night was a blast. Thank you Ragnar and Alex for putting on a fun night and playin’ some great tracks (you too, Roman). Thanks to all who came out to support. Can’t believe I’m still alive. Posted in News on December 31, 2010 by Frank Vollmann. That’s in less than one week, suckas! Come and drink your snake oil with the man who sells the best on the market. Posted in News on December 17, 2010 by Frank Vollmann. Posted in News on August 22, 2010 by Frank Vollmann. Will be guest DJ’ing at Monster Mash on Thursday, July 15th along side Ragnar and Crawfish. 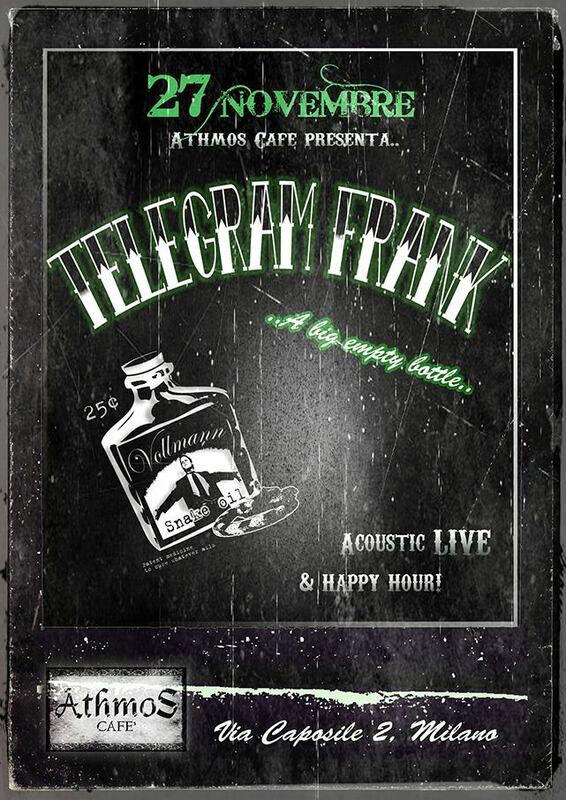 Telegram Frank will be playing whatever the hell he wants so come listen and dance to tunes HE likes. 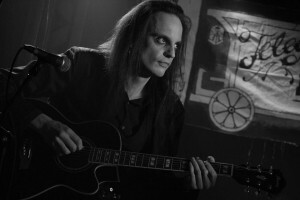 Ghosts of Dawn (Hamburg) will do an acoustic set this evening. Posted in News on July 15, 2010 by Frank Vollmann. Posted in News on July 9, 2010 by Frank Vollmann. Reminder! 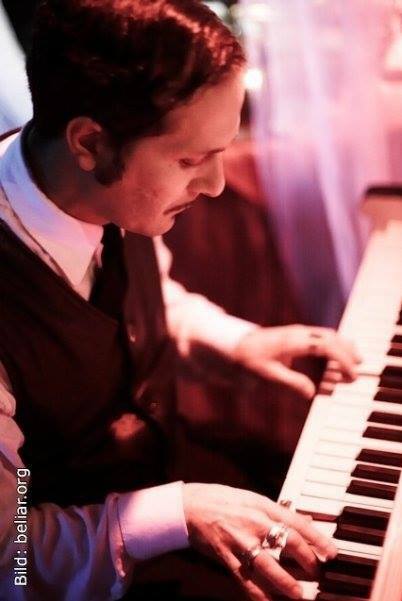 There will be a free Telegram Frank show tonight @ 7pm (19uhr), featuring Justin Stephens of Passion Play with Mr. Fez Wrecker gracing us with his presence. 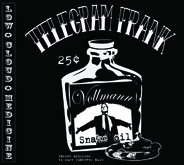 So come on down and be healed while bathing in the snake oil that is the Telegram Frank Traveling Medicine Show. Posted in News on June 21, 2010 by Frank Vollmann. A free Telegram Frank Show Monday, June 21st featuring Justin Stephens of Passion Play and Mr. Fez Wrecker possibly gracing us with his presence. So come on down and be healed while bathing in the snake oil that is the Telegram Frank Traveling Medicine Show. Posted in News on June 15, 2010 by Frank Vollmann.